Think you can pull off burnouts, drifts, and breath-taking jumps in your sedan just because you’ve seen all the Fast and Furious films? Being a stunt driver takes years of practice and the right equipment—and you probably have neither. But it turns you can get a similar experience by just slapping a GoPro on a Hot Wheels car and send it hurdling down a track. 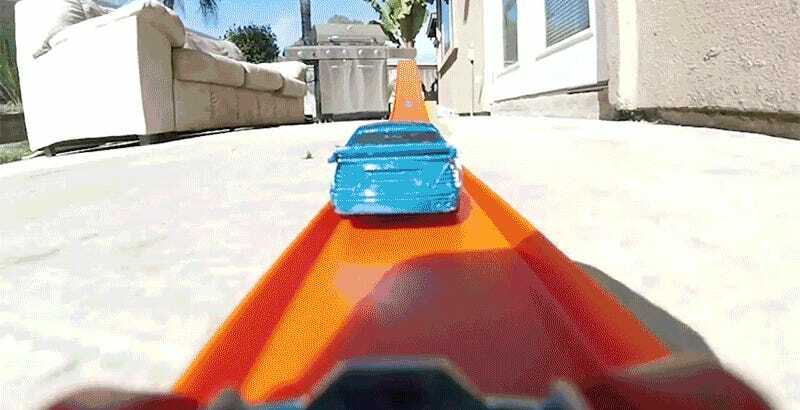 The first-person shots in this video were created using a modified Hot Wheels car designed to serve as a camera dolly for a compact GoPro Hero Session action cam. So at any time the only thing being risked during all these sweet stunts is a few hundred dollars worth of action camera, not thousands of dollars of car, plus the safety of a driver and passengers.